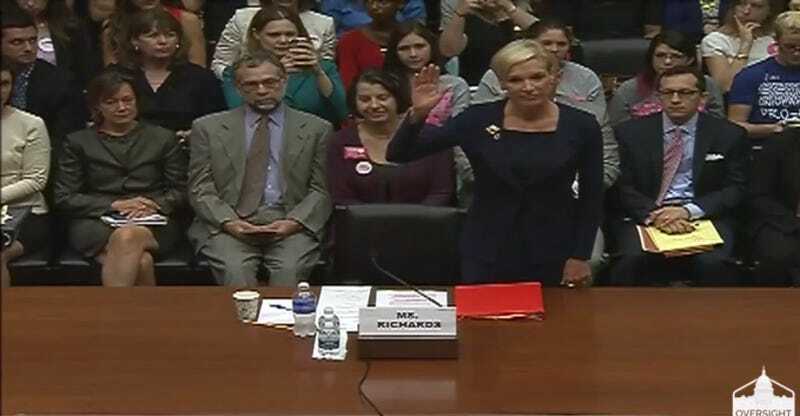 Planned Parenthood Federation of America President Cecile Richards testified Tuesday morning before the Republican-controlled House Oversight Committee. The majority of the committee was interested in “investigating” Planned Parenthood’s federal funding, and also in letting the public know they think abortion is bad and wrong, and that they find Richards morally disgusting. House Oversight Chairman Jason Chaffetz of Utah began crying immediately, with an opening statement largely about his mother, who died of breast cancer, and his wife, who works for a plastic surgeon who treats women who’ve had mastectomies. His point being that cancer kills, and we could “quadruple” cancer spending if we only defunded Planned Parenthood. Richards also addressed the CMP videos directly. “The outrageous accusations leveled against Planned Parenthood, based on heavily doctored videos, are offensive and categorically untrue,” she told the committee. “I’m trying to answer your question,” Richards replied, mildly. “Zero federal funds are related to—” Richards began. Chaffetz also told Richards that Planned Parenthood “does not do mammograms,” which is true. Neither do private practice gynecologists, or anyone but a radiology center, which Richards patiently tried to point out. Richards responded that she’d never seen the slide before and that the information wasn’t accurate. “It comes straight from your annual reports,” Chaffetz said.